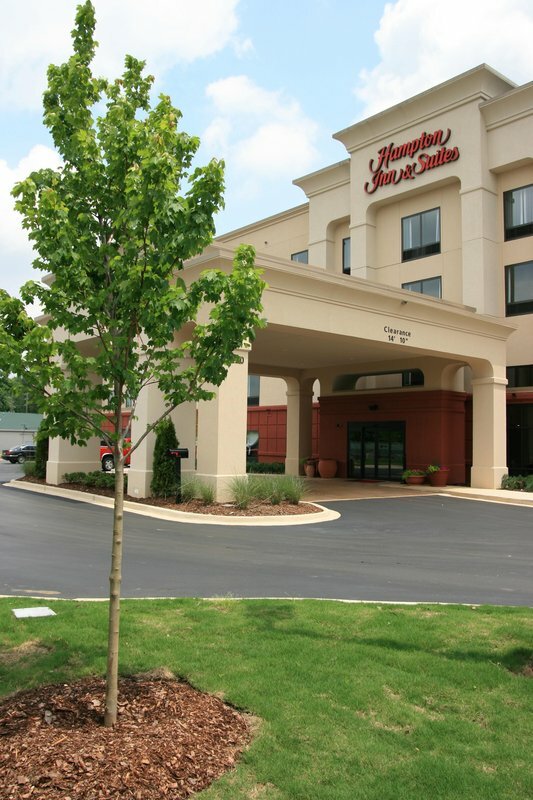 Check Rates & Availability at Hampton Inn - Suites Birmingham Airport Area AL! The Hampton Inn - Suites Birmingham-East I-20 features all interior rooms large breakfast area Indoor Pool and Exercise Room along with a guest laundry. We provide you with complimentary high-speed internet access microwave refrigerator coffee maker hair dryer 32* TV clock-radio iron and ironing boards and lap desk. The Cloud Nine Bedding Experience will make you have the best peaceful sleep since your travels. The duvets are filled with synthetic materials for extra puffiness. This also makes the duvet hypo allergenic. Your bed will have 3 pillows 2 jumbo feather pillows on one side and 2 jumbo synthetic pillows. While using the lap desk you will be able to rest your back with the lumbar pillow. The bathroom has fluffy towels curved shower rod for more space and a WaterPik showerhead to relax the muscles. Located in the lobby you will enjoy our On the House hot breakfast provided with a large open sitting area. Should you need a little snack late at night the Suite Shop is located in the lobby area as well. If you are in a hurry be sure and grab one of the On the Run Breakfast Bags weekdays located at the front desk. Our Meeting Room is located on the ground floor with 576 square feet to fit your needs whether a meeting or a family gathering. Enjoy a swim in our Indoor Pool or a good work in the Exercise Room. We look forward to your stay here at the Hampton Inn - Suites Birmingham-East I-20. All reservations must be guaranteed with a major credit card or advance cash deposit to hotel regardless of time of arrival. All reservations must be cancelled by 4pm to host time unless deposit is required. Policy subject to change.